Soul food is usually associated with the South and things like okra, grits or chicken fried steak, but if Wisconsin could be said to have a soul food, it would be beer brats. A summer BBQ or tailgate party wouldn’t be complete without them and grilled bratwurst are sold at the student union at UW‐Madison, where Kelly and I went to college. Living in Ireland, though, I can count the number of times I’ve had bratwurst on one hand, and each of those times they were made by the same man, the legendary Ed Hick. I’ve seen him a few times lately at the Sheridans and Bloom food festivals, so I snapped up a pack and lost no time making beer brats. And since I was already feeling nostalgic, I went ahead and made a German potato salad too, another summertime staple when I was growing up. Put the two together and add some sauerkraut, and it was enough to bring a homesick Midwesterner to tears. Like cooking with wine, you don’t want to use the cheapest beer here, but don’t use your nice microbrew either — just something good that you’d want to drink. 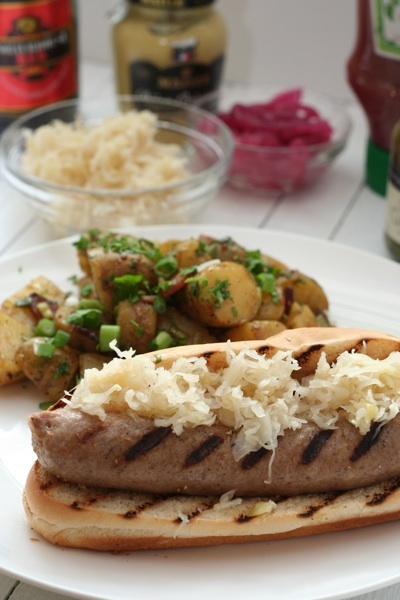 The handy thing about cooking the bratwurst this way is that if you’re having a big BBQ and cooking for a crowd, you can grill the brats a bit ahead of time and put them back in the warm beer for a little while until you’re ready to serve them. Prick each bratwurst a few times with a fork. Place them in a large pot or saucepan with the onion halves and cover with the beer. Bring to a boil, then reduce to a simmer and cook for 5 to 10 minutes, until the bratwurst are cooked through. Remove the brats from the beer and grill them on a hot BBQ for about 5 minutes, turning to make sure they’re golden brown on all sides. Serve on lightly toasted hot dog buns with toppings of your choice. German potato salad is actually served warm, though any leftovers are also delicious cold. Halve or quarter the potatoes, depending on how big they are (you want them to be in bite‐sized pieces) and place in a large pot with enough water to cover them by several inches. Bring to a boil over a high heat, add a very generous pinch of salt and reduce to a gentle boil. Cook for 5 to 10 minutes, until the potatoes are tender when pierced with a knife, being careful not to overcook them (check them after 5 minutes). While the potatoes cook, combine the vinegar, sugar and some salt in a small saucepan. Place over a medium heat, stirring occasionally, until the sugar dissolves. Drain the potatoes into a colander, then transfer to a large mixing bowl. Drizzle with the hot vinegar mixture, gently stirring until all the potatoes are coated. Set aside. Saute the bacon in a large skillet on a medium‐low heat until browned and crispy. Remove with a slotted spoon and drain on paper towels. Sprinkle the potatoes with the bacon, spring onions and chopped parsley. Stir to combine. Transfer to a serving bowl and serve immediately, while still warm.